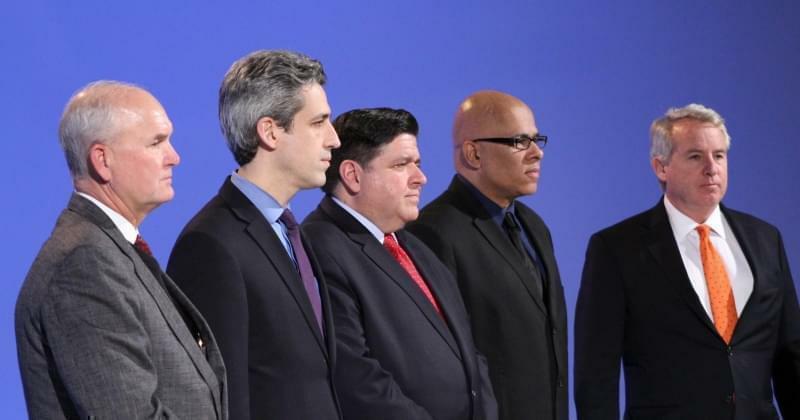 Democratic gubernatorial candidates (L to R) Robert Marshall, Tio Hardiman, Chris Kennedy, J.B. Pritzker, Bob Daiber, and Illinois Sen. Daniel Biss, left to right, participate in a debate Friday, March 2, 2018, in Chicago. Democratic Illinois governor candidates J.B. Pritzker, Chris Kennedy and Daniel Biss traded some familiar criticisms Friday in an otherwise tame primary debate that also touched on the role of Latinos in their campaigns and possible incentives for Amazon. Biss, a state senator from Evanston, repeatedly noted Pritzker and Kennedy's wealth, comparing them with Republican Gov. Bruce Rauner and warning "let's not make that mistake again." Kennedy criticized Biss for supporting legislation that allowed "sweetheart" incentive deals for corporations such as Sears, while Pritzker said he's done the most to create jobs and support working people. 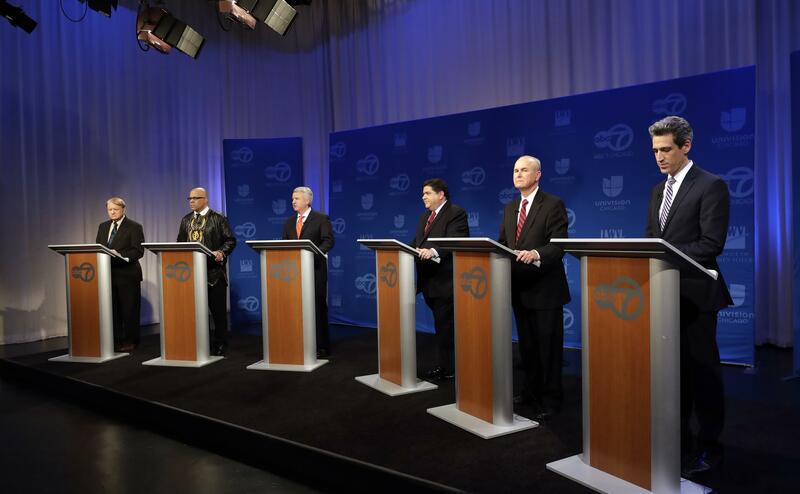 Also participating in the hour-long debate hosted by WLS-TV in Chicago, the League of Women Voters and Univision Chicago were educator Bob Daiber, anti-violence activist Tio Hardiman and physician Robert Marshall. The winner of the March 20 primary will face either Rauner or Republican state Rep. Jeanne Ives in November. While several candidates have African-American running mates, no ticket includes a Latino or Latina, prompting a question about their role in the campaigns and any future administration. Kennedy noted he has the backing of Cook County Commissioner and former Chicago mayoral candidate Jesus "Chuy" Garcia and that civil rights activist Dolores Huerta is also a campaign supporter and was in the debate audience. He said he volunteered at a social service agency that helps Latinos when he first moved to Chicago. Biss said he's worked with immigrant rights groups on "a series of battles" in the Legislature and will continue to do so. He named several Latino aldermen who have endorsed him, but didn't mention that his first running mate was Latino. Biss dropped Chicago Ald. Carlos Ramirez-Rosa as his lieutenant governor candidate because of his positions on Israel. Pritzker said he has a plan for job creation in the Latino community and support from U.S. Rep. Luis Gutierrez and Comptroller Susana Mendoza. He also pledged to stand up against President Donald Trump's attempts to eliminate protections for immigrants brought to the U.S. illegally as children. Daiber said he interviewed some Latinos to be his running mate but was "not successful," though he said Latinos know he'd be receptive to them. Hardiman said his first choice for his lieutenant governor was Latino, but turned down the job. Marshall said, "I don't really know that many and I don't have any on my staff." Pritzker said it's an unfortunate reality that cities and states compete for companies such as Amazon, which is seeking a site for its second U.S. headquarters and some 50,000 jobs. But he said Illinois needs to offer incentives to get the headquarters, and that the return on investment should be spread across the state, not just the chosen site. Kennedy said incentives should be given if it's the only way a company will create new jobs in Illinois, while Biss said the state must be careful that doing so doesn't concentrate even more wealth among the top of the income scale. Hardiman said he'd try to get Amazon to locate in a community that needs it most, such as East St. Louis or Chicago's South Side, while Daiber — the only candidate from Southern Illinois — would urge the company to expand there.